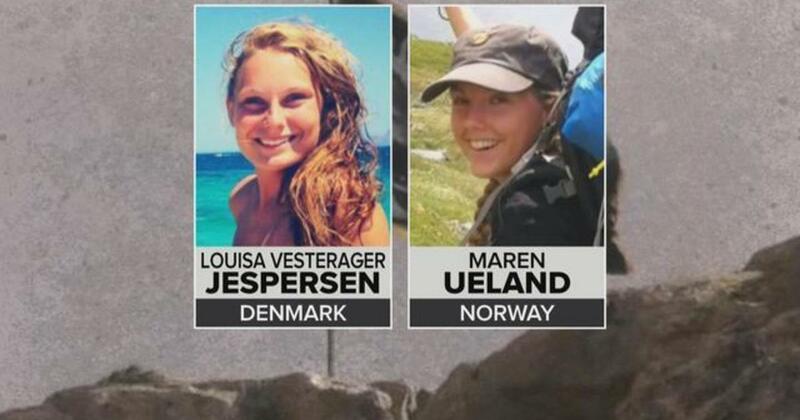 The graphic images purportedly show the severed and partially severed head of the young backpackers, 28-year-old Maren Ueland of Norway and 24-year-old Louisa Vesterager Jespersen of Denmark...Authorities in Morocco consider the killings a terrorist act. Police seized another video in which four of the murder suspects appear to pledge allegiance to the Islamic State group. "Irene Uelands Facebook page was spammed with hundreds of horrible images of her daughters slit throat and Jespersens severed head, news.com. au reported." They aren’t actually liberals but Leftists. In fact, it might be an abuse to call many Leftists “progressives”, and progressives already weren’t proper liberals. It is not naive ....it is an attempt to resolve the cognitive dissonance of what they think, with the reality of what the world actually is. This is hideous. Yes, the girls were naive - mostly thanks to the international Muslim loving press - but dont blame the victims. Blame the killers and those who encouraged them, which would include the press, the EU and Christian churches. That’s where my son wants to go next. Hope he changes his mind. Except for Chicago, still think USA is safest place in the world. Waiting on those liberal actors to defend those killers as just being misunderstood and saying also you can’t blame the ROP for the actions of a few. The title makes it sound like the mother sent the photos. How awful for the mother to have to see those images. I wonder how all those people got them? I know a few young women, blonde, slim and pretty, who would rather be dead then involved with a normal white guy. They date dregs, scum and derelicts of society, looking for who-knows-what. One is living with a Muslim in Europe where she supports him, while he abuses her and runs around and they are furious that she can’t bring him to the States, all the while professing their hatred for the USA. He is going to bring her to his home country, Turkey, for a visit. Her parents are beside themselves, thinking she may never be able to get out once he has her passport. Face it, the liberals are winning by brainwashing our children. Two good looking blonde women from Scandinavia hiking alone in the mountains of a Muslim country. Not gonna end well. According to all accounts the two women had set up camp and were attacked in their tents while sleeping by these mongrels. A horrific way to die and thankfully they took down the video these animals took on their phones of the beheading of one of the ladies and posted online. The attacks happened on Monday, but the world is learning of it days after it happened. Maybe now the European rank and file will finally wake up and demand their governments stop this insane refugee flow from Muslim countries into their lands! Maybe wishful thinking, but a gory event like this could be the catalyst! 28? One of these women was 28 and still doing the “exciting life of travel and new experiences” bit? Their culture (and ours) isn’t failing, it has failed. That’s as far as I will go to avoid speaking I’ll of these murdered women. Severed heads of blonde infidels who's mere presence insults Allah = Islamic Justice. Those people who attack counter jihadists with racist bigot, islamophobe; etc., have blood on their hands. With all the islamophilllia going around (undeserved, btw...)it is no wonder these two young ladies would not realize the threat of Islam until their necks were being cut off and maybe not even then. They weren’t rioting or protesting or organizing. They weren’t going to join the terrorists or support them. They weren’t posting on social media about the coming revolution and efforts to bring it about. So unless you have any actual evidence to the contrary, “naive liberals” is as good a description as any of these unfortunate women. "Authorities in Morocco consider the killings a terrorist act. Police seized another video in which four of the murder suspects appear to pledge allegiance to the Islamic State group..."
I think that this is where the "authorities" say that they still uncertain about a motive.